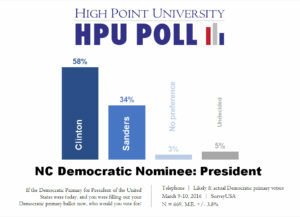 HIGH POINT, N.C., March 11, 2016 – Just days before the North Carolina Primary on Tuesday, the High Point University Poll has found former Secretary of State Hillary Clinton in the lead in North Carolina’s Democratic Primary for President of the United States over Sen. Bernie Sanders of Vermont. Republican primary voters support Donald Trump with Sen. Ted Cruz of Texas following behind. Likely and actual Democratic primary voters found that a majority (58 percent) support Clinton and 34 percent favor Sanders. On the Republican side, 48 percent of likely and actual primary voters said they support Trump while Cruz received 28 percent support. Gov. John Kasich of Ohio received 12 percent support and Sen. Marco Rubio of Florida received 8 percent support. The HPU Poll also asked about likely and actual voter preferences for the Republican and Democratic nominations for North Carolina Governor and U.S. Senate for North Carolina. On the Republican side, an overwhelming majority (73 percent) of likely and actual Republican primary voters say they favor Gov. Pat McCrory over the other candidates on the ballot, C. Robert Brawley (8 percent) and Charles Kenneth Moss (6 percent). For Senator, 56 percent of likely and actual Republican voters support incumbent Sen. Richard Burr, while 20 percent of voters support Greg Brannon, 5 percent support Paul Wright and 3 percent support Larry Holmquist. Seventeen percent of voters are undecided. Among Democrats, the majority (64 percent) of likely and actual Democratic primary voters support North Carolina Attorney General Roy Cooper for Governor, while 18 percent support Kenneth Spaulding and 19 percent are undecided. Twenty-seven percent of likely and actual voters are undecided about their choice for Senator while 52 percent support former state representative Deborah Ross. Her other opponents, Kevin D. Griffin (9 percent), Chris Rey (7 percent), and Ernest T. Reeves (5 percent), received little support. 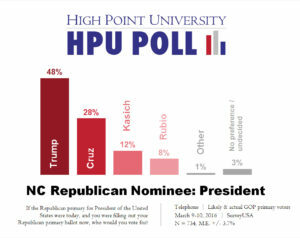 Methodology: The High Point University Survey Research Center contracted SurveyUSA to interview 1,600 state of North Carolina registered voters March 9 and March 10, 2016, using landline respondents drawn from a Registration Based Sample (aka Voter List Sample) purchased from Aristotle in Washington, D.C. and a sample of other likely voters who responded on their smartphones, laptops, tablets, or other electronic devices. To be included in the sample, a voter who had registered prior to 2008 must have voted in the 2008 and 2012 presidential primaries as well as the 2014 general election; respondents registered between 2008 and 2012 voted in the 2012 presidential primary and 2014 general election; respondents who had registered between 2012 and 2014 voted in the 2014 primary or the 2014 general election; and the remainder of the sample registered between 2014 and 2016. Of the 1,576 likely November voters, 22 percent were determined to have already voted in person or by absentee ballot in the March 15, 2016 primary election. All likely voters also responded that they would certainly or probably vote in the Democratic or Republican primary. Other respondents were not considered likely primary voters. Respondents reachable on a home telephone (78 percent of likely November voters) were interviewed on their home telephone in the recorded voice of a professional announcer. Respondents not reachable on a home telephone (22 percent of likely November voters), were shown a questionnaire on their smartphone, laptop, tablet, or other electronic device. Data are weighted toward the voter file demographic proportions for age and gender. Details from this survey are available at http://bit.ly/1XikNdW.